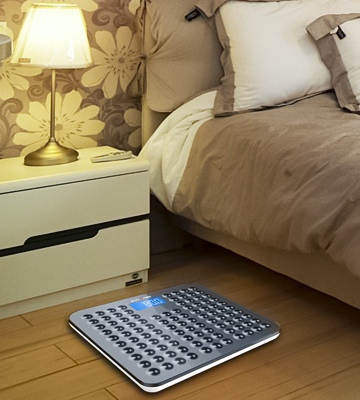 This smart weight scale can store the information about an unlimited number of users. It can even be connected to your phone if you download the RENPHO app. The app interface isn't very intuitive. 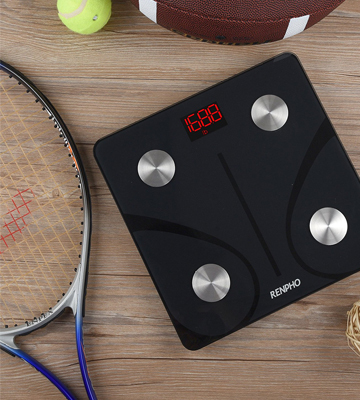 The RENPHO ES-CS20M-B is an incredibly smart device that will help you accurately track not only your total body weight, body fat %, BMI, and muscle mass but also your body age and much more. It really gives a comprehensive body composition analysis. The package includes a body measuring tape marked with both cm and inches that will allow you to observe your weight loss/muscle gain progress more clearly. The lighting might seem too bright at night. This stylish scale with a transparent tempered-glass surface will perfectly blend with any bathroom interior. Equipped with special anti-skid pads, the unit won't skid even on a slippery tile floor. The newest high-precision sensors ensure the most accurate measurements. The purchase includes specifically designed carpet feet so the unit works on carpets and not only on hard surfaces like its rivals. 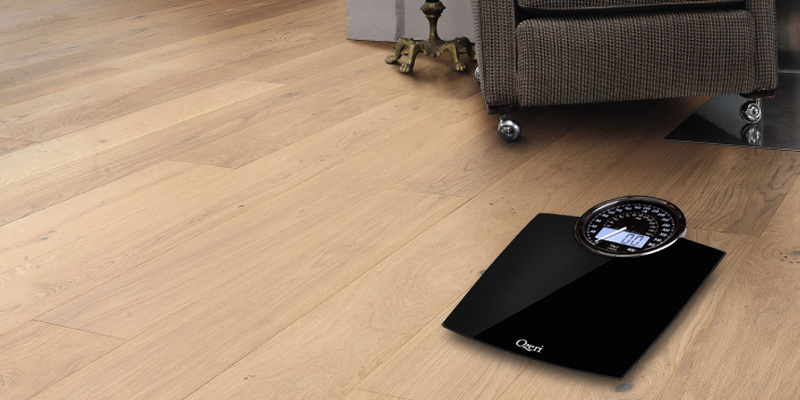 Hence, you will be able to use the scales in any room of your house. The instructions could be more informative. In addition to weighing, this smart Salter scale in ultra-thin tempered glass housing allows making your body composition measurements. Just tap on the scale to activate it and get the readings the very moment you are on the platform. Designed to save data of up to 4 users, it's a great choice for a family. 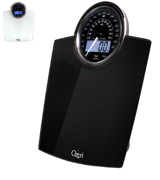 Owing to the unique, eye-catching design and built-in alarm, the Ozeri bathroom scales will let you monitor all your body changes on a daily basis for you to correct your fitness program in a due way. Not as stable as some other models; step only in the middle. 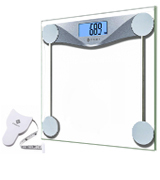 The combination of stay-of-the-art classy design, accuracy of results and usability makes these scales a great fit for most users who look after their health. Thanks to a unique skidproof design, this bathroom scale is safe to use. Even if you step on the platform with wet feet after taking a shower, it won't be slippery at all. As the batteries discharge, the unit might not activate as soon as you step on the platform. 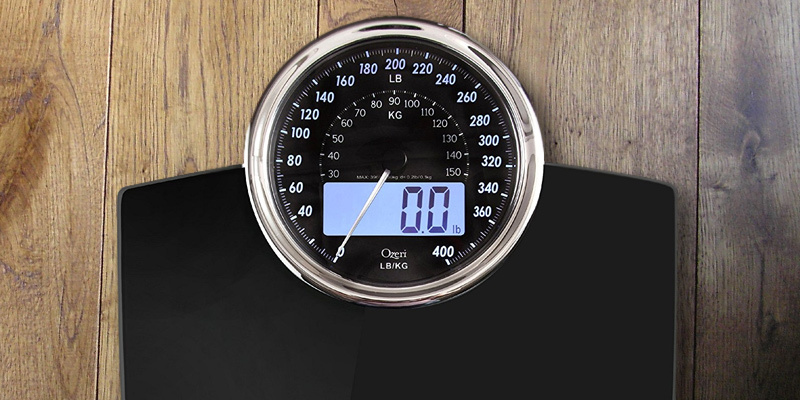 Featuring an unconventional yet practical design, the Accuweight digital scale is a good bargain for those looking for an accurate and reliable appliance. The measurements are easy to see on its large blue backlit display. Plus, this comfy model has a wide measuring range. 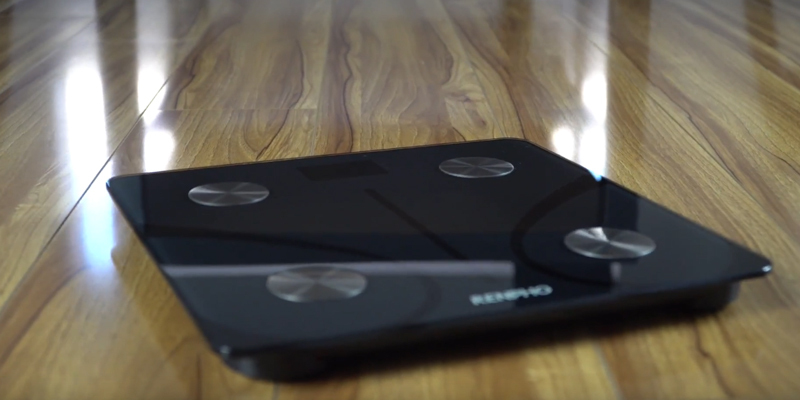 The RENPHO ES-CS20M-B Bluetooth Smart Scale can provide you with a complete body composition analysis. The scale accurately measures your body weight, fat-free body weight, BMI, body fat percentage, water percentage, skeletal muscle, bone mass, muscle mass, protein, basal metabolism, and your body age. To get all the information, you need to step on the scale with your bare feet. No buttons to mess with and no special tricks! 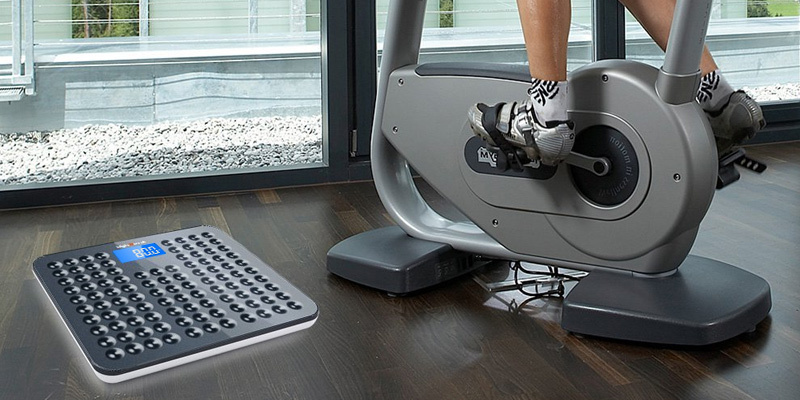 Simply step on and touch all 4 electrode areas to allow the sensors to scan your body composition. All the metrics are obtained very quickly, especially weight. It'll take you about 10-15 seconds to get the comprehensive analysis of your body. The digits are quite big and easy to read. The unit surface is made out of 5 mm tempered glass and the base is produced from high-quality ABS plastic. These materials allow you to quickly clean off all the tears and the crumbs that might drop on the scale. 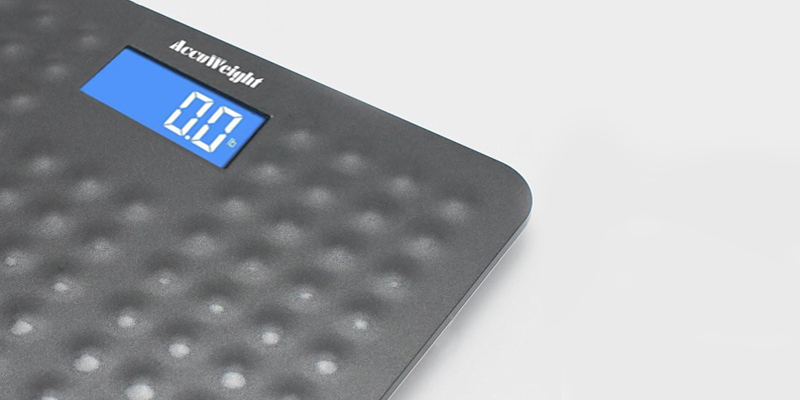 The RENPHO Bluetooth scale has a classic black design that will blend perfectly into any bedroom or bathroom. Setting up the scale is a simple process. 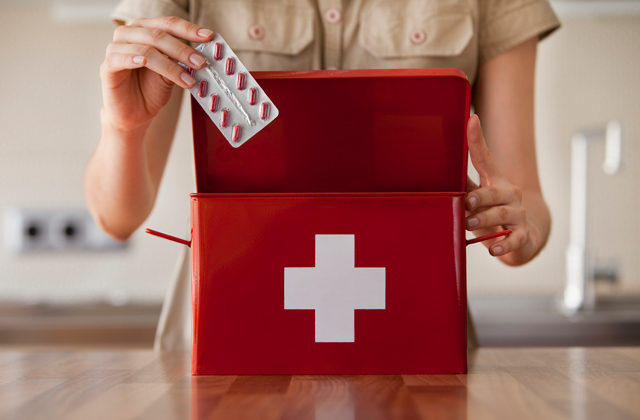 All you need to do is put the batteries in (included in the package) and then download the RENPHO app (available for free on both Apple App Store and Google Play Store) to your smartphone. Before use, you'll need to enter your current personal information. The app will keep a history so that you can track your progress. Also, you'll be able to add as many family members as you wish. If needed, you can share your fitness data with Fitbit and Google Fit apps. 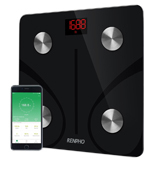 The only thing we would like to note is that the scale uses Bluetooth Low Energy standard and its range is rather short. Therefore, you need to keep your phone in the same room for synchronization. 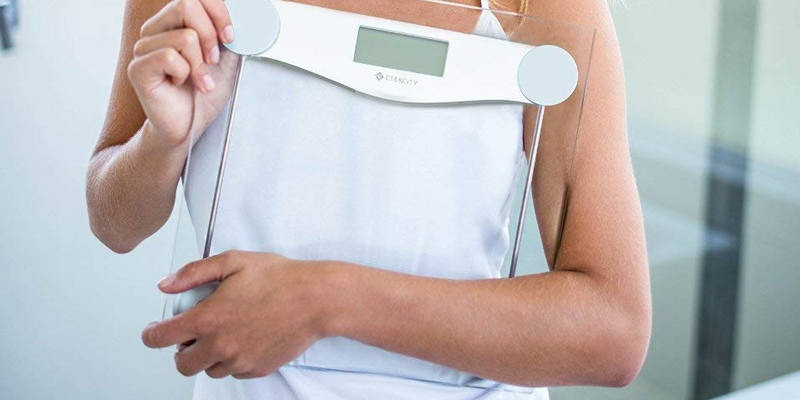 However, even if you are weighing yourself without a phone, the measurements will automatically sync to the app when it is connected again. Summing up, this innovative tool can help you monitor your self-improvement progress using not only the scale itself but the newest smart apps that can give you a more comprehensive information. Using this smart scale is a great way to encourage you and your family for new achievements. The first step is the hardest, they say, but is so much easier if you know you are going in the right direction. The Etekcity bathroom scale is a simple yet effective tool that helps you to monitor your progress and thus encourages you for new achievements. Not only does it look elegant and appealing; the unit features a user-friendly Step-On technology, allowing you to see the measurement results on the unit's display as soon as you step on the platform. To ensure the measurements are correct, the manufacturer has equipped the scale with four high-precision sensors. The item has 0.2 lbs/0.1kg graduations; your weight can be displayed in kilograms, pounds, or stones. 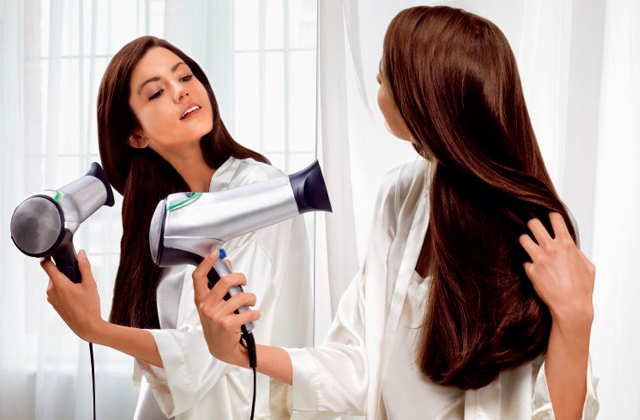 For user's convenience, the unit of measure is easy to change by pressing the conversion button on the device's back; the measurements are easy to read thanks to the read lock function. 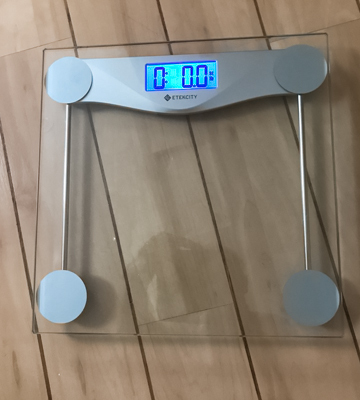 The bathroom scale's calibration is very simple, too, just put it on a hard surface and step on the platform with one foot to activate the display; when the unit recalibrates and shows “0.0”, you can start weighing. 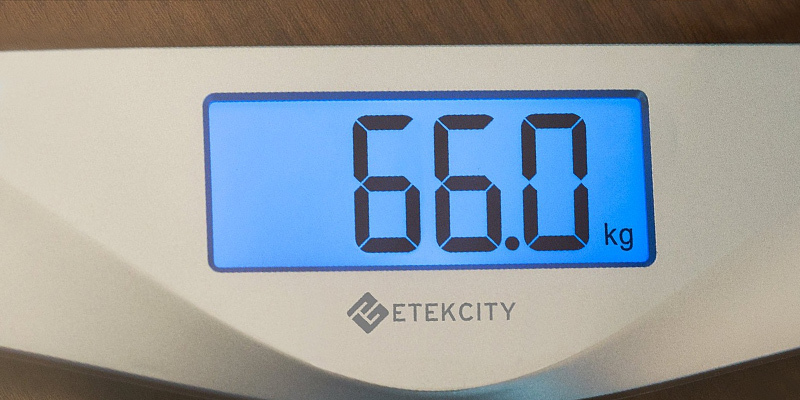 Elaborately designed and precise, the Etekcity digital scale is also very durable and convenient in use. The item features a large 12" x 12" platform made of the highest quality 8 mm thick tempered glass, you can rest assured, it won't crack or break even after years of use. In addition to a strong bearing surface, the unit is equipped with a large backlit LCD display, a low battery indicator, and an overload indicator. The bathroom scale is powered by 2 x GP AAA batteries included in the box, so you won't have to buy them separately. Oh, and one more bonus, a handy measuring tape with centimetres on one side and inches on the other, is included in the box. Thus, you will be able to track not only your body weight but your girth measurements as well. All in all, the Etekcity bathroom scale is a great tool to make your self-improvement routine an easy and enjoyable task. It is very important for your health to stay hydrated throughout the day. With a quality water filter, the water you drink will be crystal clear and safe for your health. Being on the market for over half a century, Salter Housewares is one of the most respectable scales manufacturers out there. 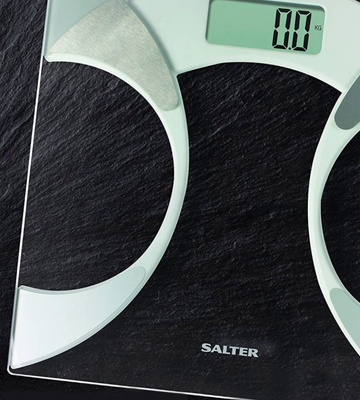 Their products are accurate, innovative, and user-friendly, so this review would not be complete without Salter bathroom scales in it. The model we have chosen for our shortlist is their best-selling scales. This smart device not only checks your body weight but, using BIA (Bio Impedance Analysis), measures your body composition, BMI, body fat, and body water. Knowing these parameters will help you to adjust your diet and exercising scheme in order to achieve excellent results in the shortest time. 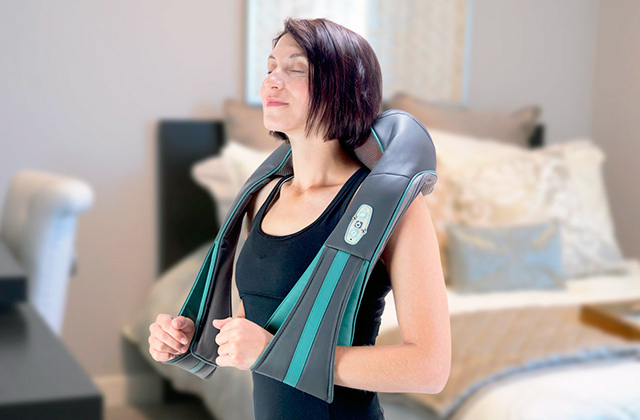 This BIA technology uses a tiny electrical impulse that flows through your body to determine fat and lean tissue percentage, and it is absolutely safe - you won't actually feel a thing. This smart scale can save data of up to 4 persons, hence, you can create personal user accounts for your family members, inputting their age, gender, and height for more comprehensive body composition analysis. This model is a great choice both for individual users and for a family of healthy lifestyle followers. The unit is simple in use; it is activated by vibration, so all you need to do before weighing is to tap the platform with your foot and step on it - the measurements will be displayed right after that. You can switch between imperial and metric measurements and the weighing results will be displayed on an ergonomic LCD screen. A single CR2032 battery is included in the box and you can start checking your body weight and other important parameters as soon as the scales arrive. An elegant glass platform, despite being only 6 mm thick, is sturdy and durable. One more special feature that makes the unit stand out from the crowd is the included carpet feet. In other words, the Salter 9141 works on carpets allowing you to make precise measurements in any room of your house while most other models would only work on a hard surface like a tiled bathroom floor. 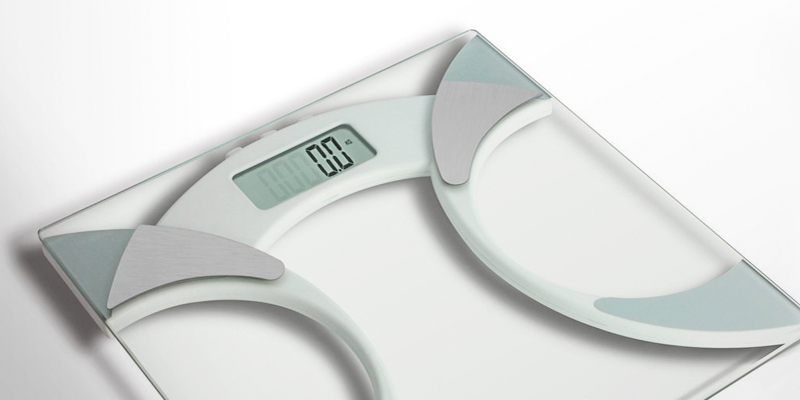 In a word, as innovative and user-friendly as it is, the Salter Slim Analyser bathroom scale is made to last. It has a robust design and a toughened glass platform, and it comes with a 15 years manufacturer's guarantee, which speaks for itself. The most appealing design solutions emerge where two different things are successfully combined. The Ozeri digital bathroom scale doesn't look like its competitors, for it combines retro design with an innovative and reliable mechanism. The unit utilizes four GX sensors to ensure precise weight measurements with 0.2 lbs (0.1 kg) increment. An auto-calibration is one more feature added to ensure accurate results each time. A Step-On technology will allow you to get the readings the moment you step on the scales; with that, the unit can display your weight in both pounds and kilograms. It might be not so easy to see the results on a mechanical dial though it looks gorgeous and adds to the style; however, you will clearly see the numbers on an integrated digital display, no matter what the light conditions are. The platform is made of impact-resistant tempered glass and is quite large, therefore, it is not only stylish and durable but also practical and convenient in use. The bathroom scale is powered by 3 AAA batteries (included in the box); it has an energy-saving auto shut-off feature and a low battery indicator that will inform you when it is time to replace the batteries with new ones. To be in good nick, it's important to know your weight and correct your diet and physical activity on time. For this purpose, using scales is a must. 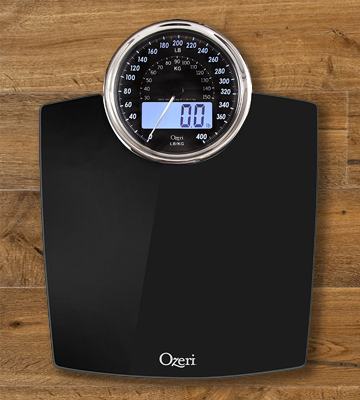 These Ozeri Rev bathroom scales are probably the best fit for everyday use. You won't be able to ignore its eye-catching design and, whenever passing by, you'll be tempted to jump on it to know your current weight. In addition to a large LCD display to show the readouts, the scales offer a built-in alarm to inform you when it is time to take measurements. This will help you develop a good habit of weighing yourself at the same time every day. According to nutritionists, mornings are considered to be the best time to do this. So, this is how you can set it to remind you of a regular body weight check. The next step to perfection is monitoring your physical activity throughout the day. That is why we recommend you get a fitness tracker. If you are looking for a high-quality electronic scales at an affordable price, opt for this Accuweight model. It offers you all the benefits you would look for in a device of this kind, plus an enhanced user-friendly design. To ensure the most accurate results, the Accuweight bathroom scale is equipped with four latest version sensors. It has a 3.5-inch blue backlit display that allows you to see the measurements in any lighting conditions. The scale has a measurement range of 5-180 kg (11-400 lb) and 0.1 kg (0.2 lb) graduation increments; the data can be displayed in pounds, kilograms, or stones, and it is easy to switch between the units using a button on the scale's back. 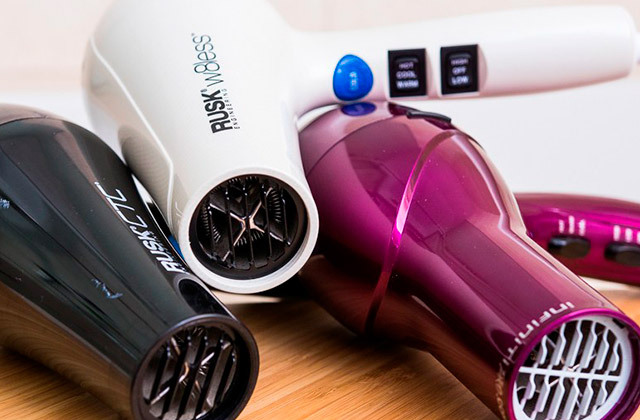 An auto-off function will help you save battery power; by the way, this model runs on 2 AAA batteries that come with the purchase, so there will be no need to buy them additionally. The bathroom scale has all the basic features including an overload and a low battery indicator, and an auto-zero feature. Moreover, thanks to the Step-and-Read technology, you will be able to instantly see your weighing results as you step on the scales. Now, it is time to speak about what makes this model stand above its rivals. 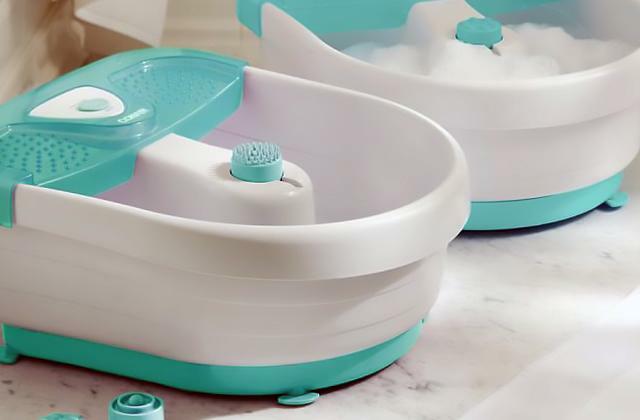 With the user's comfort and safety in mind, the manufacturer had provided the scale with the unique skidproof design - its platform has a non-slip surface, making your weighing safe even if your feet are wet. That said, please, do not forget to wipe the unit's surface before use if it has water droplets on it. In addition to a non-slip surface, the item has rubber feet so that it stays stable on the floor providing accurate weight measuring; the rounded anti-collision corners add to the safety as well. According to the consumers' feedback, the unit provides the most comfortable weighing; it is simple in use, sturdy, and durable. 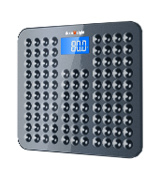 So, if you are looking for reliable yet moderately-priced electronic scales, this model fits the bill. Drinking detox teas can make wonders in improving your general well-being and getting the body of your dream for they help to boost your metabolism and remove slags and toxins from your body. What Is a Bathroom Scale? We live in the time of contrasts. On one hand, there are more and more overweight people because of the sedentary lifestyle or unhealthy diet. On the other hand, there are more and more people calling for a healthy lifestyle. 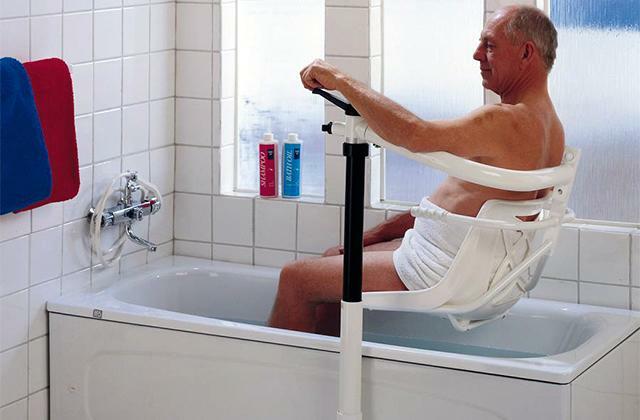 In view of this, a bathroom scale is a worthy purchase for anyone. Moreover, this seemingly simple device has become a high-tech product these days. There are cutting-edge smart scales measuring your BMI (body mass index), accounting both your lbs weight and its correlation to your height. They also can take your heart rate measurements, body fat, muscle/bone balance, and many other data to let you monitor your body condition. But if you just want to measure your weight, you can find both digital and mechanical bathroom scales specially designed for this purpose. 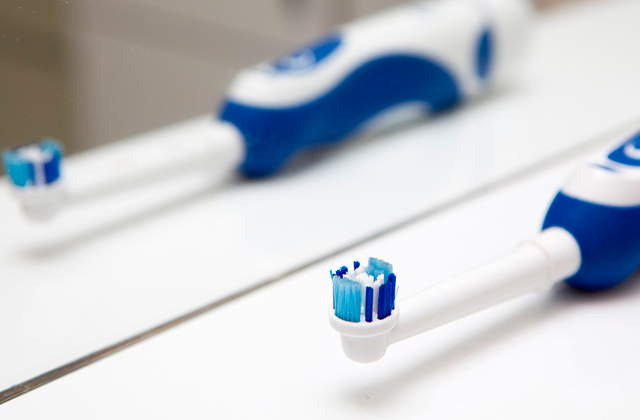 It is a known fact that a proper oral care is of great importance for the human health too. That is why we suggest looking through our electric toothbrushes review and choose the device to keep your smile beautiful and healthy. If you love listening to music when having an invigorating shower or taking a relaxing bath, consider buying these fantastic shower speakers. An analogue scale is the simplest option. It is a mechanical device set to work by a spring under the platform. The higher the pressure on the spring is, the higher the weight is going to be shown on a dial. Using this kind of scales, you can only measure your body weight. We would like to stress that you do not have to buy or recharge batteries, all you have to do is put the scale on a rigid even surface. Yet, experience has shown that such devices sometimes have inaccurate measurements compared to the digital weight scales. 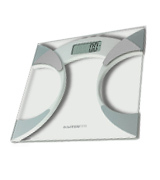 Digital bathroom scales take measurements with the help of electronic sensors. The innovative technology of modern digital bathroom scales allows making a wide range of measurements, and almost all of such scales can be referred to smart models. For example, they can control the correlation of your body fat, muscle, bone, and water. These measurements are very important if you really take care of your health; any deviation from the norm may be a signal to consult a doctor. A correlation of body fat to a total body weight is defined by bioelectrical impedance analysis (BIA). 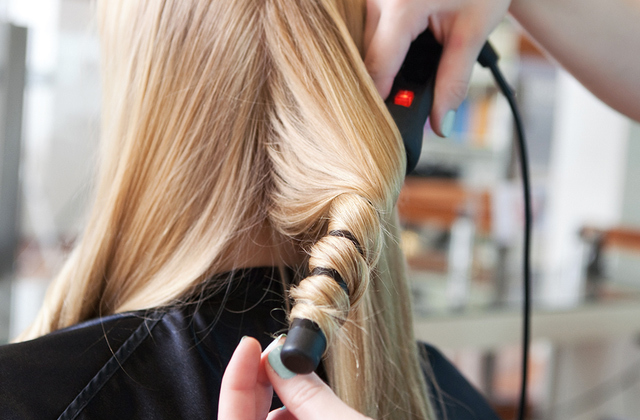 A minor electrical charge is sent through the body to estimate the measurements. The current passing speed is different due to the different environmental resistance. You will certainly appreciate this option as well as water measurement while you are on a diet. If you are building up physique, there is an option of muscle measurement. Most of the devices in our bathroom scale review come with specific apps which give you more ways to control your body state and health. It is worth noting that most of the modern scales make measurements up to 400 lbs, that suits even those who have just started working off excess weight. If you need to control every ounce of your weight, you should choose a bathroom scale with the smallest increment. By the way, most modern scales have increment less than 0.2 lbs. In order to check your scale's accuracy, you should put an item (with a certain weight) on it, for example, 5 lbs bag of flour. If you get the expected weight, you can fully trust your scales. This one is affected by the display, platform, and other characteristics. For a clear image, the display size (including numbers on it) and the backlit count for much. Furthermore, the platform should be large enough for a comfortable weighing. All these characteristics are important for all kinds of bathroom scales. If you are going to choose an electronic weight scale, there are more things to consider. A "Step-On" feature makes the weighing as easy as possible: you get your measurements the moment you step up on a platform. You can even save and monitor data from several people, a wonderful option for a family. Smart scales with an Athlete mode will work as your body analyzer. They are a perfect choice for those who go in for sport and spend a lot of time exercising. Bluetooth and Wi-Fi connections to your smartphone via a special application will let you monitor the dynamics. 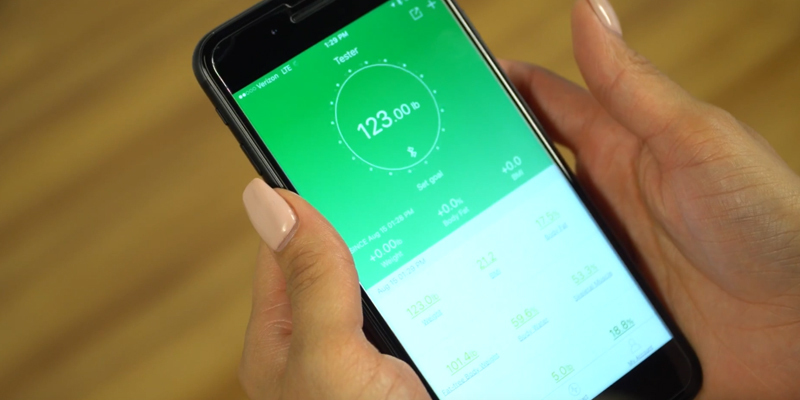 Some apps can even work as your personal nutritionist and coach. They will give you a detailed guidance on your lifestyle and workouts according to your personal measurements. If your digital watch scale requires batteries, please, consider their type. One might think it is not that important. Yet, it is known that it is advisable to always keep the scale in your field of view. This will help regularly make measurements and keep your eyes on your body condition. A perfect place to catch your eye is a bathroom or bedroom. Consequently, if you place your scale there, there's very little chance you may skip your morning procedure and leave home without checking up on weight change. That is why bathroom scale design is so important. Make sure the scale is made of quality, durable material and is easy to clean from dust. Starting a journey, you need to get the right gear and learn as much as you can about where you are going and what is waiting for you on the way. Your healthy life journey is not an exception. Your weighing scale is one of the essential tools that will help you check the direction, and the knowledge of how to use this tool correctly will save you from many problems as well as show you shortcuts on the road to success. So, before you set off, please consider these useful tips. Digital scales require calibration each time you move them. 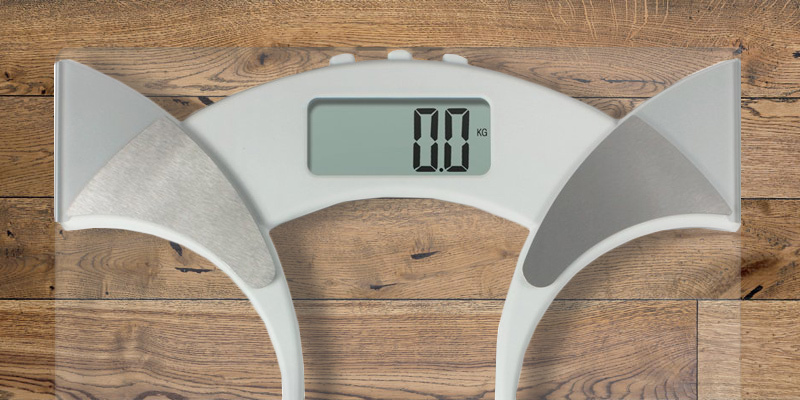 Moving your scales may cause inaccuracy, so any time you rearrange them, it is recommended to recalibrate the device to set the correct zero weight. Calibrating digital scales is not difficult at all, please check your chosen model's manual to find out how to do it. Place the scales on an even hard surface. This will help you get precise measuring results each time. Some units have special feet for carpeted flooring, though. In any case, please follow the manufacturer's instructions to ensure accurate readings and a long service life of the unit. Your weight does not stay the same throughout the day; it changes as you eat, drink, go to the toilet, exercise, and even breathe. That is why it is advisable to weigh yourself in the morning on an empty stomach. Losing weight takes time. You might be tempted to see great results right after an exercise, however, your bathroom scales will more likely show your water loss than the weight loss. Be patient, wait till next morning, and don't get desperate if you haven't lost much weight compared to yesterday's measurement. Burning fat is not an instant process, it takes time and effort. Calculating an average, say, for a week and comparing it with the previous week's average will give you a more precise impression of your progress. Weighing yourself once or twice per week is also an option, however, performing it on a daily basis can help you to become more organized. Your clothes and accessories can add up to 2.5 kg (or five pounds) to the displayed weight; do not forget to take off your garments and shoes before you step on the scales. Stick with the same scales. Surprisingly, it is not easy to find bathroom scales that show the same results as you weigh due to different mechanics, missed calibration, etc., hence, up to 2-3 kg (5 lbs) difference is quite common if you compare your home and the gym's scales. To see your progress and keep being motivated, always use the same unit, and the best option is to use your own electronic scales so that you can be sure they are calibrated and you can weigh yourself in minimum or no clothing. The way you feel is no less important than the numbers you see on the screen. If you practice healthy eating and keep up training yet you cannot see any progress, it does not mean you are not getting healthier. Though your body fat decreases during training, your muscle weight increases. By the way, if you want to monitor this process, consider buying smart scales that can show your body water, body fat, and muscle percentage and BMI - with them, you will be able to analyse the changes. 1. Scale buying guide, Consumer Reports. April 2016. 2. Jennifer R. Scott How to Pick the Best Bathroom Scale for Weight Loss, Verywell. October 6, 2016. 3. Oll McKean How to buy the best bathroom scales, Which? 4. Maggie Fazeli Fard Weighty decision: How to choose the right bathroom scale, The Washington Post. April 9, 2013. 5. Carl Laron How to Buy a Bathroom Scale, ConsumerSearch. January 25, 2016. 6. Heather Dale Make Your Day Work! Here's When to Eat, Work Out, and Indulge, POPSUGAR. September 30, 2015.